'Sweet Heart'. My take on a classic. Modern day reproduction fabrics highlight my charming 12" x 14" (30.5 x 35.6 cm) traditionally pieced and hand-quilted miniature sampler quilt. 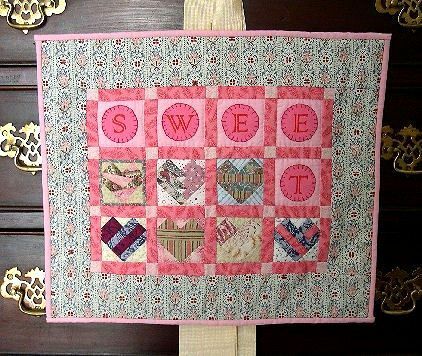 I've pieced seven classic 2" heart themed quilt blocks using beautiful 1860's reproduction fabrics in pinks and pastels and then stenciled the remaining 5 'plain' blocks with the letters S W E E T.
Each of those 5 letter circles is embroidered with a blanket stitch onto 'plain' blocks using Danish Embroidery Thread. I hand-quilt the piece and then finish with a double (French), binding by hand to complete a charming historic look. A nice squared-up piece, 'SWEETHEART' will lie flat and look lovely as a table topper. If you prefer to have this as a wall piece, on the reverse side you'll find finishing corner hanger-triangles, made in a solid accent fabric. A sweet reminder any time of the year, perfect at Valentine's Day or a birthday ... perfect for all those times words cannot express the love you feel.